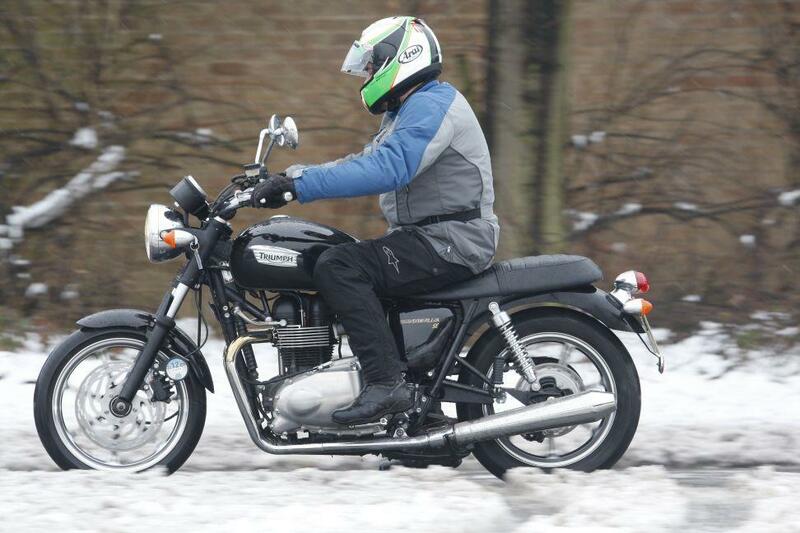 If the roads are white with snow you are best off leaving the bike at home. But if you get caught out by a sudden weather change and you've no choice, here are some tips to keep you rubber side down. Slow right down, use a higher gear than normal and read the road ahead carefully. Although it's tempting to travel in the wheel tracks of other vehcles, the snow there can be hard-packed into ice and you might get more grip in the 'virgin' snow. Try to relax and make moderate inputs on the controls, no hard acceleration or braking. Light hands and feet let you feel what the bike is doing under you. While we're on the subject of braking, use engine braking more and apply more rear brake than front because if you do lose traction it's going to be the rear that breaks away first and you've got more chance of saving it. Make one control input at a time - don't brake while steering, downshift BEFORE you get into a turn, accelerate AFTER you come out of a bend, don't shift your weight in the middle of a turn, etc. etc. Each of these things adds stress to the tyres' contact on the road... multiply them and you multiply your chances of coming off. Watch out for other road users, they don't see you on a good day when they know you'll be around, in snow they won't be expecting to see you as well, so you'll be nigh-on invisible. Give yourself about four-times the room you'd normally need to stop and be aware that cars heading in the opposite direction can skid into your path too.